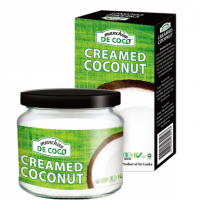 Creamed coconut is added to Indian, Thai and Asian recipes to enrich curries and sauces. In the west it is primarily used in confectionery items, ice cream, and sauces. Not to be confused with the related coconut cream.